1استادیار گروه شیمی، دانشکده علوم پایه، دانشگاه تربت جام و مدرس گروه گیاهان دارویی، دانشگاه تربت حیدریه. 2دانش‌آموخته کارشناسی ارشد شیمی تجزیه، گروه گیاهان دارویی، دانشگاه تربت حیدریه. اصلی‌ترین عامل ایجاد قدرت رنگی در زعفران ترکیبی به نام کروسین به فرمول شیمیایی C44H64O24 است. کروسین یکی از چند کاروتنویید محدود موجود در طبیعت است که به‌آسانی در آب حل می‌شود. این حلالیت یکی از دلایل کاربرد وسیع آن به‌عنوان رنگ دهنده در مواد غذایی و دارویی نسبت به سایر کاروتنوییدها می‌باشد. قدرت رنگی زعفران یکی از پارامترهای عمده تعیین کننده کیفیت زعفران می‌باشد که با اندازه‌گیری میزان کروسین موجود در آن مورد ارزیابی قرار می‌گیرد. روش میکرو استخراج مورد استفاده در این تحقیق از جدیدترین و ساده‌ترین روش‌های میکرو استخراج است که می‌تواند با موفقیت برای پیش تغلیظ و جداسازی کروسین در نمونه زعفران بکار رود. سرعت، ارزانی و آنالیز آسان در طیف سنجی UV-Vis مورد استفاده در اندازه‌گیری کروسین نسبت به سایر روش‌های اندازه‌گیری، از مزایای این روش است. بررسی‌ها نشان‌داد که نوع و حجم حلال پخشی و حلال استخراج در بازده استخراج تأثیر بسزایی دارد. در این پژوهش از استون به عنوان حلال پخشی و دی‌کلرو‌متان به عنوان حلال استخراج استفاده شد. تحت شرایط بهینه، منحنی کالیبراسیون در دامنه 00001/0-15/0 میکروگرم بر میلی‌لیتر خطی بوده و حد تشخیص روش 000008/0 میکروگرم بر میلی‌لیتر است. روش پیشنهادی تحت شرایط بهینه برای اندازه‌گیری کروسین نمونه‌های زعفران مناطق مختلف مورد استفاده قرار گرفته است و درصد بازیابی بسیار خوبی با خطای کم محاسبه شده است. 1Assistant Professor, Department of Chemistry, Faculty of Science, University of Torbat-e Jam and Department of Medicinal Plants, Faculty of Agriculture, University of Torbat-e Heydariyeh. 2M.Sc. Analytical Chemistry, Department of Medicinal Plants, Faculty of Agriculture, University of Torbat-e Heydariyeh, Torbat-e Heydariyeh, Iran. The main component responsible for color in saffron is crocin with the chemical formula of C44H64O24. Crocin is one of several carotenoids in nature that is soluble in water. This solubility is one of the reasons for its widespread usage as a colorant in food and medicine compared to other carotenoids. The coloring strength of saffron is one of the major factors that determine the quality of the saffron stigma. It will be evaluated with measuring of crocin. Microextraction is the newest and easiest method that can be successfully applied for the preconcentration and separation of crocin in saffron samples. The advantages of this method are faster, cheaper and easier analysis by UV-Vis spectrophotometry in measurement of crocin compared to the chromatographic analysis methods. The studies showed that the type and volume of disperser and extractant solvent have a significant effect on the efficiency of crocin extraction. In this work, acetone as the disperser solvent and dichlorometane as the extractant solvent were found to be suitable combinations. Under the optimal conditions, the calibration curve was linear in the range of 0.15-0.00001 μg mL-1 and the limit of detection (LOD) was calculated based on 3 Sb/m (where, Sb and m are the standard deviation of the blank and slop ratio of the calibration curve respectively) was 0.000008 μg mL-1. The procedure was applied to saffron samples and the good recovery percent for the saffron samples was obtained. Abdullaev, F. 2002. Cancer Chemopreventive and Tumoricidal Properties of Saffron (Crocus sativus L.). Experimental Biology Medicine 227: 20-25. Ahmed, F.E. 2001. Analyses of pesticides and their metabolites in foods and drinks. TrAC, Trends Analytical Chemistry 20: 649-661. Assimiadis, M.K., Tarantilis, P.A., and Polissiou, M.G., 1998. UV-vis FT-Raman and 1H NMR spectroscopies of cis–trans carotenoids from saffron (Crocus sativus L.). Journal of Applied Spectroscopy 52: 519–522. Biparva, P., Ehsani, M., and Hadjmohammadi, M.R. 2012. Dispersive liquid–liquid microextraction using extraction solvents lighter than water combined with high performance liquid chromatography for determination of synthetic antioxidants in fruit juice samples. Food Composition and Analysis 27: 87–94. Caballero-Ortega, H., Pereda-Miranda, R., and Abdullaev, F.I. 2007. HPLC quantification of major active components from 11 different saffron (Crocus sativus L.) sources. Food Chemistry 100: 1126–1131. Dadfarnia, S., Haji Shabani, A.M., and Kamranzadeh, E. 2009. Separation/preconcentration and determination of cadmium ions by solidification of floating organic drop microextraction and FI-AAS,Talanta 79: 1061-1065. Dadfarnia, S., and Haji Shabani, A.M. 2010. Recent development in liquid phase microextraction for determination of trace level concentration of metals, A review. Analytica Chimica Acta 658: 107-119. Dadfarnia, S., Salmanzadeh, A.M., and Hajishabani, A.M. 2008. A novel separation/preconcentration system based on solidification of floating organic drop microextraction for determination of lead by graphite furnace atomic absorption spectrometry. Analytica Chimica Acta 623: 163-167. 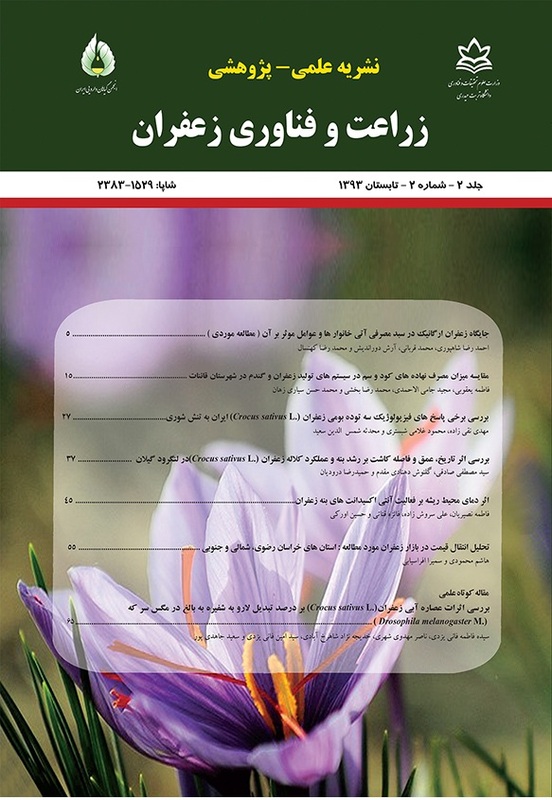 Ghaedi, M., Shokrollahi, A., Kianfar, A.H., Pourfarokhi, A., Khanjari, N., Mirsadeghi, A.S., and Soylak, M. 2009. Preconcentration and separation of trace amount of heavy metal ions on bis(2-hydroxy acetophenone) ethylendiimine loaded on activated carbon. Hazardous Materials 162: 1408–1414. Hosseinzadeh, H., Modaghegh, M.H., and Saffari, Z. 2009. Crocus sativus L. (saffron) extract and its active constituents (crocin and safranal) on ischemia-reperfusion in rat skeletal muscle. Evidence Based Complement Alternative Medicine 6: 343-50. Khalili Zanjani, M.R., Yamini, Y., Shariati, S., and Jonsson J.A. 2007. A new liquid-phase microextraction method basedon solidification of floating organic drop. Analytica Chimica Acta 585 (2): 286-293. Kocurova, L., Balogh, I.S., Sandrejova, J., and Andruch, V. 2013. Solvent microextraction: A review of recent efforts at automation. Microchemical Journal 110: 599-607. Lozano, P., Castellar, M.R., Simancas, M.J., and Iborra, J.L. 1999. Quantitative highperformance liquid chromatographic method to analyse commercial saffron (Crocus sativus L.) products. Journal of Chromatography A 830: 477–483. Ma, M., and Cantwell, F.F. 1999. Solvent microextraction with simultaneous back-extraction for sample cleanup and preconcentration: Preconcentration into a single microdrop. Analytical Chemistry 71: 388-393. Mounira Lage, M., Charles, L., and Cantrell, C.L., 2007. Quantification of saffron (Crocus sativus L.) metabolites crocins, picrocrocin and safranal for quality determination of the spice grown under different environmental Moroccan conditions. Scientia Horticulturae 121: 366–373. Narasimhan, S., Chand, N., and Rajalakshmi, D. 1992. Saffron: quality evaluation by sensory profile and gas chromatography. Journal of Food Quality 15: 303–314. Rezaei, M., Assadi, Y., Milani Hosseini, M.R., Aghaee, E., Ahmadi, F., and Berijani. S. 2006. Determination of organic compounds in water using dispersive liquid-liquid microextraction. Journal of Chromatography A 1116: 1-9. Sampathu, S.R., Shivashankar, S., and Lewis, Y.S., 1984. Saffron (Crocus sativus L.): cultivation, processing, chemistry and standardization. Critical Reviews in Food Science and Nutrition 20 (2): 123–157. Tarantilis, P.A., Tsoupras, G., and Polissiou, M., 1995. Determination of saffron (Crocus sativus L.) components in crude plant extracts using high-performance liquid chromatography–UV–Vis photodiode-array detection-mass spectrometry. Journal of Chromatography A 699: 107–117. Tarantilis, P.A., and Polissiou, M.G. 1997. Isolation and identification of the aroma components from Saffron (Crocus sativus). Journal of Agricultural and Food Chemistry 45: 459–462. Tarantilis, P.A., and Polissiou, M.G. 2004. Chemical analysis and antitumor activity of natural and semi-natural carotenoids of saffron. Proceedings of the 1st International Symposium on Saffron Biology and Biotechnology 2003. Acta Horticulturae 650: 447–461. Zgota- Grzeskowiak, A., and Grzeskowiak, T. 2011. Dispersive liquid-liquid microextraction. Trends Analytical Chemistry 30: 1382-1399. Zougagh, M., Rios, A., and Valcarcel, M., 2005. An automated screening method for the fast, simple discrimination between natural and artificial colorants in commercial saffron products. Analytica Chimica Acta 535: 133–138.